PR, clarinet; Kenny Barron, piano; Henry Grimes, bass; Paul Motian, drums. Welcome to LOST TONES which features tracks from hyper-rare recordings that aren’t available anywhere else on the web. These treasures are courtesy of George Scala, who runs the invaluable Free Jazz Research site. He’s generously shared them from his amazing archive so they can be enjoyed by more than just collectors. Each selection is something that we unequivocally love and feel deserves a wider audience. – Here you go. Check your coats? Your server will be by in a moment. – Hi, my name’s Bix and I’ll be taking care of you tonight. Tonight’s special is the “funk dumpling.” The chef has prepared the pastry with hand-rolled dough in the traditional Chinese manner. He’s added a unique filling that’s a distinctive mix of free jazz, soul, bebop, and rhythm and blues. He describes the taste as a complex groove with hints of melody and harmony underneath. It’s quite delicious. I don’t think you’ll be disappointed. WHO WAS USING THE WORD FUNK IN 1962? The album title is just one of the ways that this remarkable album was ahead of its time. It’s an extremely early and often overlooked example of mixing adventurous jazz with soul grooves — while also drawing on bebop, cool jazz, and Indian music. Not to mention an increasingly rare stab at making a jazz album center on the licorice stick (cf. Leonard Feather’s Nov 1961 article in Down Beat, “The Clarinet in Jazz…What Happened?”). Basically, it’s a precursor of many of the interesting musical developments that would transpire over the following decade and a half. 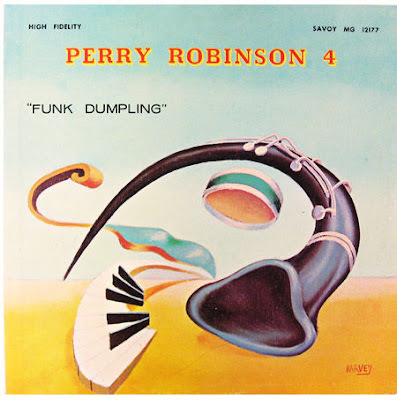 In the album’s liner notes, Tom Wilson (later to record Bob Dylan) claims that “Perry Robinson is single-handedly resuscitating the jazz clarinet.” Robinson, whose father was a noted film composer, discusses how many of his influences were modern tenor sax players including John Coltrane and Sonny Rollins. He notes how the complex “Home Is Where the Hearth Is” is similar to Coltrane’s “Giant Steps,” only slower. “Farmer Alfalfa” penned by Henry Grimes, his collaborator on the session, evokes Trane, Dolphy, and Ornette, while also referencing soul music. “Superbly hip,” Wilson calls it. 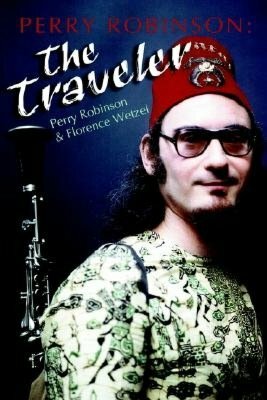 Learn how how Robinson signed the exact same contract as Bird, not realizing this screwed him out almost his rights; how he adapted the folk tune “Midnight Over Moscow” and tried to convince Savoy they should release it as a single; they never did and it later became a massive hit for a British ensemble instead; how, despite the surrealist cover art, the musicians didn’t turn on before the recording (though Robinson did later trip with Mrs. Tom Wilson); how the 19-year-old Kenny Barron came to be part of this “effortless” and “magic” session. Hope you enjoyed today’s special. Let us know in the comments.